Ellerman Villa and the world-class spa is located in the gardens of Ellerman House in Cape Town and is the quintessential private retreat for a family, honeymoon couple or group of friends. It is a 21st century addition to the Ellerman experience and a breath of fresh sea air in its amazing contemporary architectural proportions that give the impression that one is on a ship. Ellerman Villa has three rooms in the separate self-contained Villa with separate TV lounge and dining room. There are also two separate rooms in the spa on the lower level that can be occupied either individually or by the family or friends occupying the Villa. Ellerman House is distinguished from other fine hotels in South Africa by the Ellerman House Art collection. The magnificent Ellerman Contemporary gallery provides guests with a glimpse of the outstanding talents of contemporary South African artists which complement those of the Masters in Ellerman House. The Owner's Cottage at Grande Provence in Franschhoek in the Western Cape is a testament to period grandeur and contemporary luxury. The beautifully appointed 5-star graded Owner's Cottage offers luxurious and private en suite accommodation to a maximum of 10 guests within a charming complex of historically significant Cape Dutch buildings. The Cottage is reserved exclusively for use by one guest or one party and not on an individual multiple bookings basis. Cuisine is at the centre stage of this luxury product in the heart of the winelands. Guests can dine in the Angel Tears Garden or at The Restaurant. The award-winning Angel Tears Collection and premium range Grande Provence wines, a selection of spirits and soft drinks are all included within the tariff. Complimentary wine tasting, cellar tours as well as a guided tour of The Gallery are all available to guests. Redcliffe House is the ideal “home away from home” for larger families or groups of friends travelling together. This Grand old Victorian House is fully equipped with 4 bedrooms, 3 Bathrooms, a lounge with double sided fire place, Dining Room with double sided fire place onto designer fully fitted kitchen, Flat Screen Television with Satellite Television, Beautiful Garden with Wooden deck overlooking Cape Town City, a Swimming Pool and Secure off street parking. 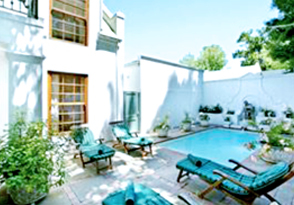 The uniqueness of The Redcliffe House experience lies in the fact that it is centrally located in Cape Town City in Kloof Street; it is owner managed and a truly Cape authentic luxury Hotel with highly personalized service. 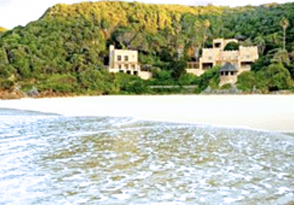 Redcliff House is situated next to More Quarters, the sister property to the Cape Cadogan Luxury Hotel. Guests staying at the House can enjoy breakfast at More Quarters if they choose not to have breakfast in the villa. This enable guests to have the full service of a hotel, but the luxury of a serviced private villa. Situated in the heart of the Constantia Valley in Cape Town, The Cellars-Hohenort is a member of the international Relais & Chateaux Association and excels in its status as one of the great country house hotels of the Cape. Nestled against the densely forested eastern slopes of Table Mountain, the hotel affords breathtaking views across the Constantia Valley to False Bay. The Madiba Villa is a gracious, two-storey Cape-style home situated in the midst of the Cellars Hohenort gardens, with its own private courtyard and small swimming pool. It features a large sitting/dining room with fireplace, built-in bar, plunge pool, service kitchen and three double en-suite bedrooms with walk-in cupboards. It is fully air-conditioned with under carpet heating and has butler service 24 hours a day. Award-winning Pezula Resort Hotel & Spa's ultra-luxury beach accommodation offering, Pezula Private Castles, is one of the most exclusive destinations in the world and is situated on exquisite Noetzie Beach. Live like royalty in this magnificent residence, which is built into the cliff-face and offers guests direct beach access, huge luxurious suites with private terraces, and personal service from a dedicated team of staff including an executive butler and private chef. The magnificent private residence provides the ultimate luxury with two living rooms with wood-burning fireplaces, a 10-seater dining room and three spacious suites with opulent bathrooms and magnificent views of the Noetzie Beach and Indian Ocean. As a guest of the Castles you will live in the lap of luxury in one of the most beautiful locations in the world.Your meals will be freshly prepared according to your own personal tastes. You'll find the bar stocked with your favourite drinks and South African wines. You can laze at the heated outdoor pool, work out in the private gym or drink cocktails in the gazebo perched above the most beautiful beach in South Africa. This luxury lodge located in the southern region of the Shamwari Game Reserve in the Eastern Cape is an environmentally friendly private African thatch designed villa exclusively for families. The décor emulates an old traditional farmhouse with interiors that reflect an easy living home lifestyle in a natural environment. The lodge consists of five suites and can sleep a maximum of ten guests. The lodge features a child friendly swimming pool, dining and lounge areas, courtyard barbeque area and special children‟s menu. Keeping the focus on families, Shamwari also offers a special “Kids on Safari” programme where kids aged 4 and older have a chance of a lifetime to view the Big 5, view a special educational film and visit the Born Free Foundation and Shamwari Wildlife Rehabilitation Center. Luxury meets the wild in the heart of Africa‟s bushveld where Royal Malewane's expert guides and trackers ensure intimate game experiences and close sightings of the big five. Africa House consists of six en-suite bedrooms with private outdoor showers overlooking the bush. The rooms are all individually designed and furnished, and with its‟ immaculate furniture, bright coloured silks, handmade linens and Persian rugs on display throughout, this is an antique lovers‟ heaven. Entrance to the central courtyard, casitas and covered veranda is through 12ft tall North African doors and from this impressive arrival point there are several large living and dining areas. On an adjoining covered veranda there are more living and dining areas alongside African day beds and an immaculate infinity pool overhanging a pristine riverine system that attracts game. The Manor house is situated within the Tintswalo Concession in the Manyeleti Reserve in the Mpumalanga province and comprises a large thatched Manor boasting a crystal blue swimming pool, deep shaded patio and traditional boma. A minimum of 6 guests are required for Manor House bookings, with a maximum capacity of 10 guests. The Manor House staff is flexible to your needs and one safari vehicle, a guide and tracker are allocated to you for the duration of your stay. The Manor has 3 en-suite air-conditioned bedrooms on the downstairs level. One of the bedrooms has an optional child‟s room which leads off it. 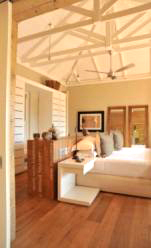 Upstairs is the main double en-suite bedroom with a beautiful view of the surrounding bushveld. Dining at the manor is enjoyed on the patio or in the open air boma under the awesome Manyeleti night sky. Manor house guests may enjoy the facilities of the Vital Source Spa & the Curio shop at the main Tintswalo Safari lodge. This lodge has been designed by the owners, the More family and therefore encapsulates both the warm, personal ambience associated with a family owned lodge and a world class luxury safari experience. Nestling on the banks of the Sabie River, 1933 represents a secluded environment where comfort and relaxation are the order of the day. 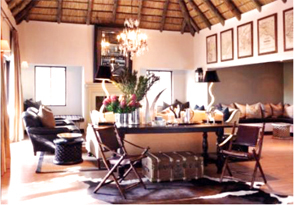 There are four spacious suites, each with their own private view of the Sabie River. The bathrooms are as inviting as the rooms, courtesy of their double vanity units, elegant bath and outdoor showers. There is also a children's dormitory, able to sleep up to 8 children, with his and hers bathroom and an inter-leading bedroom for an au-pair. 1933 at Lion Sands strives to be your dream home on holidays: a gracious home away from home with a few added luxuries, including your own private chef and ranger, with the exclusive use of a 4x4 Landrover for safari game drives. Singita Castleton Camp in the Sabi Sands Reserve is a best-kept secret! It's a sincerely inviting, comfortable hideaway that exudes timeless charm. Castleton comprises a stone-walled farmhouse and six charming rooms in a garden setting, with fascinating memorabilia and artefacts that create an ambience of understated luxury. The wide verandas and expansive lounge and dining area of the main farmhouse offers you more than enough space to relax and enjoy time with friends and family. Set amongst the dappled shade of 500 year old ebony trees, the three luxury suites & generous bush home central area is the culmination of four decades of design experience in the safari industry. Pioneer Camp is the most secluded of Londolozi's Luxury camps. This private bush home offers accommodation for family groups of 6 - 14 people through linking glass sky walkways into interconnected family units. The spacious entrance-halls are decorated with a Ralph Lauren feel; clean lines, modern and sophisticated, with floor to ceiling glass sliding panels which frame the wilderness views beyond. The bathrooms are classic Victorian with modern accents in the marble, chrome and mahogany finishes. Throughout the camp there is a pervading sense of history thanks to faithfully restored memorabilia of photographs, old suitcases, silver, crystal glass and gramophones. Everything about Pioneer Camp is deeply personal and provides a romantic backdrop to the adventures of a new generation of sophisticated travelers. Savour the luxury of Africa‟s wide open spaces with the sky and savanna theme of The Homestead at &Beyond Phinda. Breathtakingly stylish and sophisticated yet refreshingly simple, The Homestead provides the ideal venue to reconnect with friends and family offering accommodation for up to 8 guests in 4 suites. Generous courtyards, ponds and living areas that open up to the landscape beyond, embrace the surrounding bush, inviting it into the spacious interiors of The Homestead. Large sliding windows give a sense of space and light, and each ample room is dominated by breathtaking vistas of Africa. Let you personal chef and butler make you feel right at home with an interactive kitchen awaiting your instructions. Whether it‟s the simple joys of having your favourite meals prepared for you or the pure pleasure of being surprised at meal time. Morukuru is situated in the Madikwe Game reserve which is located in the North West Province of South Africa. It spans over 75000 hectares offering guests a premier safari and wildlife destination. It is a malaria-free reserve and one of the biggest national parks in South Africa. Owner‟s House, Morukuru Lodge and Farm House are all part of the unique Morukuru Family experience. The Villas, all operate on an exclusive use basis, enduring that there are never any other guests besides you and those you choose to accompany you. You'll not only have the entire property to yourself, but personal staff to attend to your every whim. The Farm House can accommodate 10 guests in 5 double suites, which are airy bright and all have their own en suite bathrooms with beautiful glass doors and windows that open out onto the bush. The other properties, The Owner's House can accommodate 4 guests and Morukuru Lodge can accommodate 6 adults and 4 junior guests. Even more wonderful are the utterly private safaris – your personal ranger, works with a gifted Shangaan trackers bringing you the very best that there is to offer at Madikwe Game Reserve. There are no set schedules at Morukuru, you are the masters of your stay and have complete freedom to do as you wish, when you wish! Little Madikwe Hills is made up of one presidential suite which has two bedrooms and accommodates two to four people, as well as two additional standard suites next door if required - therefore enabling groups of up to eight people to experience the utmost in luxury and outstanding hospitality that Madikwe Hills has to offer, creating a truly unforgettable experience that far exceeds expectations. A butler is on hand to respond to the group's every need and a dedicated game ranger and game viewing vehicle means that Little Madikwe guests can enjoy private game drives at their leisure and for as long or as short as they wish. Enjoy beauty treatments in the privacy of the Presidential Suite, and watch as your personal chef creates mouth watering meals in your private gourmet kitchen. Parents need not worry about their young ones disturbing the peace for other guests. Little Madikwe Hills‟ reception rooms are also equipped with a satellite TV, DVD collection, as well as a stereo system with an eclectic collection of CDs – allowing guests to truly feel at home.